I’m generally not fussed about being an early bird visitor to a new restaurant, not because of worries that the food or service might not yet be perfect but simply because I’m happy to wait until the buzz dies down and it’s easier to get a table. 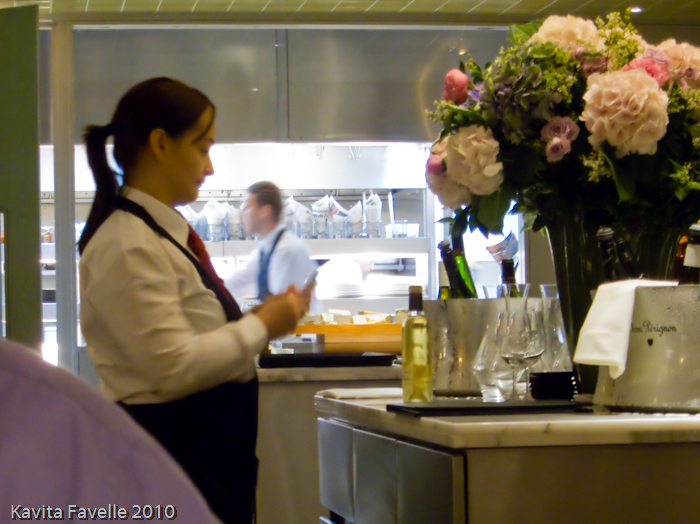 And yet here I am blogging about Pierre Koffmann’s new restaurant the day after it opened. Have I secretly been rubbing my hands about getting a blogger scoop? I’m afraid I’m not that organised; it was a last minute impulse! Having decided a couple of days ago to renew our posh weekday lunch habit (from our sabbatical in January) I was contemplating yesterday where to book for a leisurely Friday déjeuner and fancied somewhere new to us. 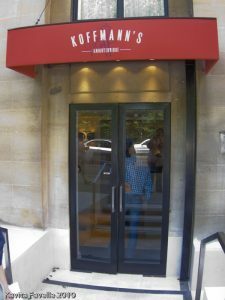 Suddenly, serendipitously, I remembered that Koffmann’s new restaurant at the Berkeley Hotel was due to open around now. A quick call revealed that it was launching the very same day. I took that as a sign! I felt a bit foolish, calling on it’s first day open to ask for a table the very next day, thinking it would surely be fully booked, but to my delight, a table was available and my reservation quickly made. Chatting later with front-0f-house manager Eric Garnier (co-founder of the wonderful Racine restaurant), I learned that they are accepting just 40 at lunch and 70 for dinner for the moment, allowing them to ensure food and service is just as it should be, before ramping up to their 120 capacity. Arriving a little early we were very warmly greeted by Koffmann’s partner, the elegant Claire Harrison. Claire is an enthusiastic, urbane and charming front of house leader and kindly showed us to a table giving me a view into the open kitchen, where I might enjoy glimpses of Koffmann and his team at work. I was a little apprehensive as we were lead inside – our table was some distance into the underground dining area, where no natural light from the sunny summer’s day outside could reach it – but the space is well lit and the tables liberally spaced out, both of which contribute to a feeling of brightness. So what’s the menu like? For this new venture, Koffmann has moved away from his haute cuisine past and is offering instead a more classic, provincial French repertoire. Many of the dishes embrace his Gascon roots. 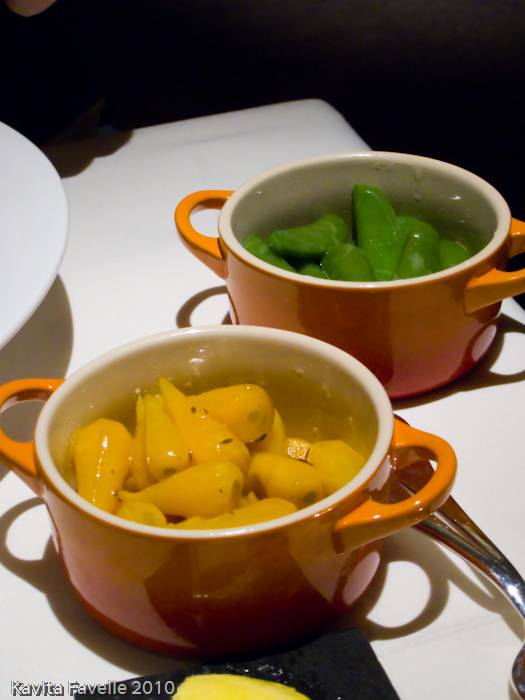 Many are good, hearty dishes made from top quality seasonal ingredients. 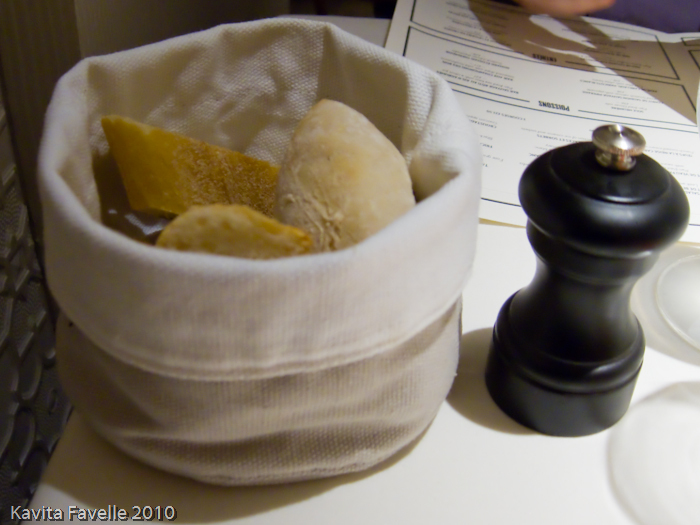 Several of his signature dishes are here – the pig’s trotter and pistachio soufflé which I sampled at his Selfridges pop-up last year, as well as scallops with squid ink. It’s a menu in which virtually every dish appeals! We mix and match from the prix fixe menu of the day (very reasonably priced at £18 for 2 courses, £22.50 for 3) and the a la carte. I reject the aperitifs listed and opt for chilled Monbazillac ‘jour de fruit’ 2007 from l’Ancienne Cure (£7) – cold, honey syrup fruit in a glass. Pete decides to stick to chilled tap water which is unobtrusively and regularly refilled throughout the meal. Shortly after being seated we are served an amuse bouche. 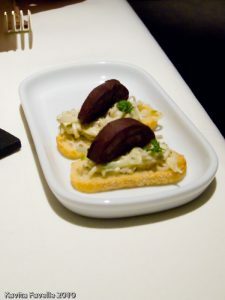 Iron-rich black pudding sits in crunchy-fresh celeriac slaw on top of a crisp toast and is simple and delicious. A basket of different breads comes with a slab of heavily salted butter, slightly too chilled for easy spreading. From a tangy sourdough to classic French stick to a plain white roll the breads are magnificent. Pete’s starter of tartine de foie gras et haricots vert is from the prix fixe menu. 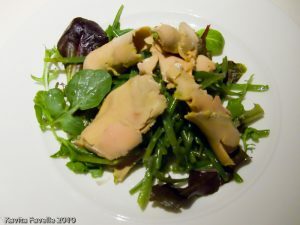 There’s no toast to be seen but we both agree that the lightly dressed cold beans and salad are a perfect foil to the thick and plentiful slices of fatty foie gras. 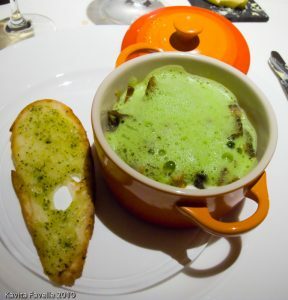 I choose the cassolette d’escargots et girolles à l’ail (£12). Musty girolles and earthy-tasting snails sat on a bed of very creamy mashed potatoes, the lot topped off by a vivid green parsley garlic foam. Whilst the ensemble tastes fantastic, I must confess that the lime-coloured foam is not attractive to me. Perhaps I’m too childish for such frippery but it’s too Fungus the Bogeyman not to giggle just a little, right? The thin sliver of garlic toast is essential to provide a bit of crunch against the soft, chewy contents of the pot. 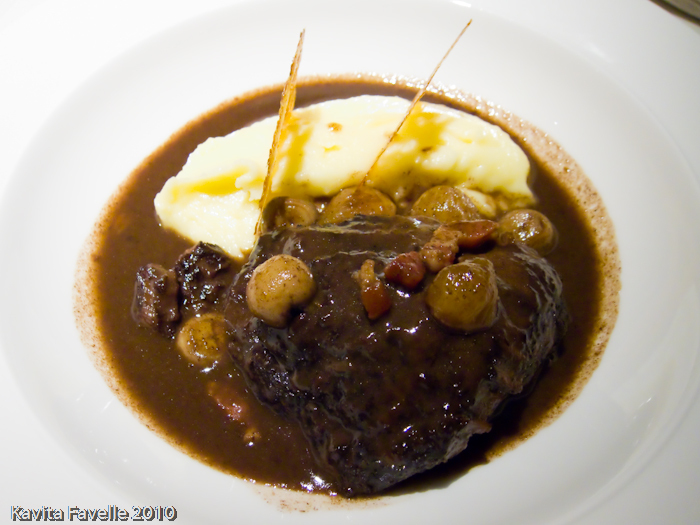 Pete’s daube de joue de bœuf (braised beef cheeks) (£20) is garnished like Koffmann’s famous pig’s trotter, with creamy mash and crispy, paper-thin wheels of bacon. The beef falls apart to the touch and is the epitome of a hearty French stew. 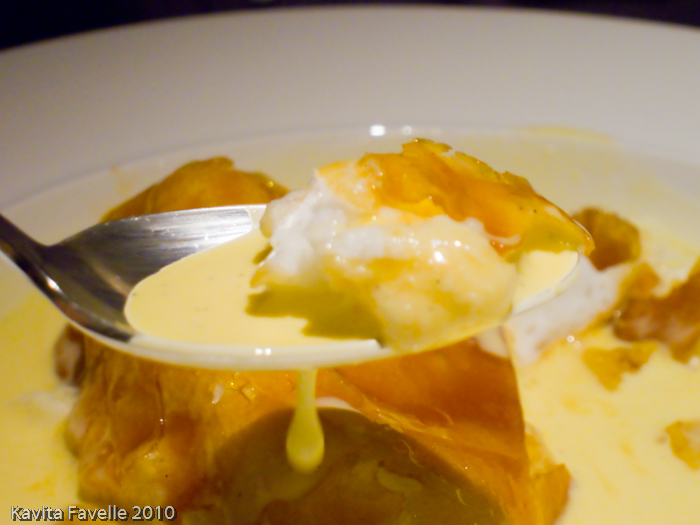 Pete’s œufs à la neige caramelisés (£7) is also one of the three prix fixe choices. As our head waiter Richard promises, it is incredibly light. 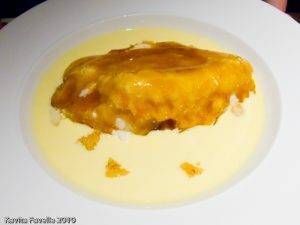 Pete delights in breaking through the caramel carapace into the pillowy meringue beneath and it’s good to see it served in a generous portion of smooth, vanilla-rich custard. Once again, one of the best examples of the dish that we’ve had for some time. I order the prix fixe croustade de fruits rouge. 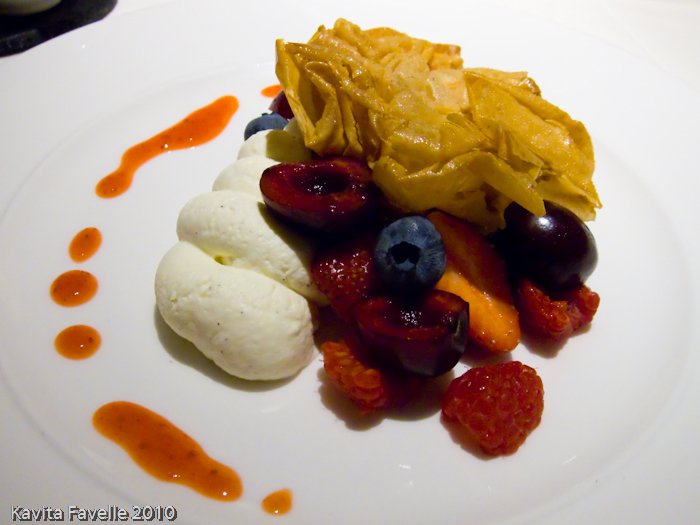 Translated as Gascon apple pie with red fruits I make sure to clarify that I want the red fruits one not the similar croustade aux pommes et Armagnac (£9) on the full desserts list. What arrives is the apple version. Full marks to Eric Garnier who quickly pours some cream onto the plate, insisting I enjoy a taste of this one as it will take a few minutes for them to ready the correct one. 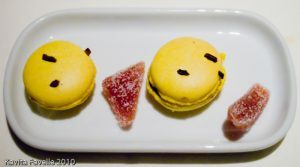 I like the couple of bites I have well enough but can’t detect any Armagnac and miss the gooey caramel I remember from the pop-up version. In just a few minutes my red fruits croustade arrives, along with a little explanation that the prix fixe menu has a few errors – this dessert doesn’t have any apple. The croustade comes perched atop a selection of fresh mixed berries and cherries and a lavish piped squiggle of sweet cream. What makes this simple plate so effective is the careful selection of perfectly ripe and delicious fruit. Satiated beyond belief, we nonetheless can’t resist tea and coffee. I order a jasmine pearls tea and Pete a latte. For me it’s a good sign of attention to detail when our waiter, on bringing the tea and coffee and noticing that the latte lacked any foam head, quickly makes a decision to have a better one made. It doesn’t take long and is definitely a more attractive glass of coffee second time around. We are both absolutely stuffed! Our bill comes to a very reasonable £85, though that’s with just the one glass of dessert wine and two hot drinks included. It could easily have been more with a few more drinks durnig the meal but it could equally have been less if we’d both stuck to the very well constructed prix fixe menu. We loved the food: great ingredients treated simply, cooked confidently, presented beautifully and full of robust flavours. This was reinforced by excellent service from Eric Garnier (front-of-house manager), Richard (our head waiter and one of 4 on duty at a time), Michael, our main waiter and the various other members of the team who looked after us. Seamless, professional, friendly and genuinely invested in giving the customer a great experience. 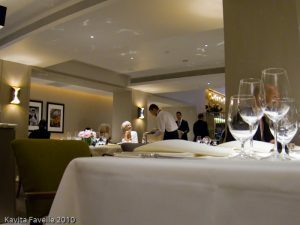 24 Comments to "Pierre Koffmann is back in business: Koffmann’s at The Berkeley"
I also was lucky enough to eat at the new Koffmanns… this is obviously going to be a sure fire hit in London! I have re-booked immediatley . What a lovely write up,all sounds delicious.Service sounds spot on too. Sounds like a really good meal and pretty good value as well. 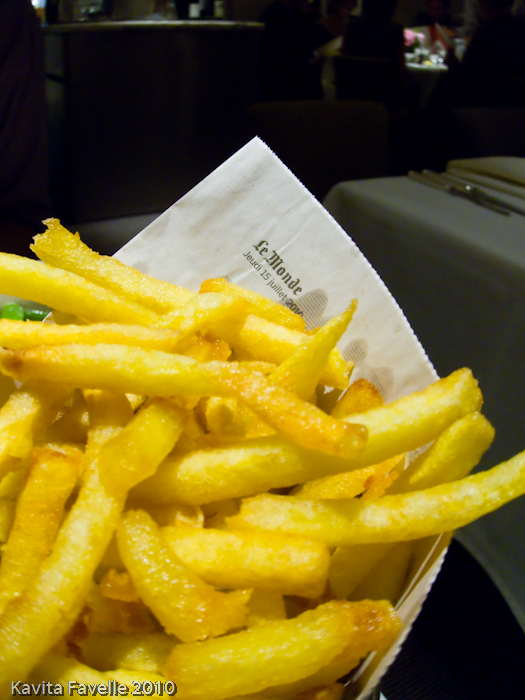 Those fries look fantastic and I love braised beef so think it would be my sort of place! I remember from the pop up that Claire was a fantastic front of house and it seems like it has rubbed off on the other staff. @Anon – I imagine it will be. I hope so – I loved it and want it to be around to revisit for a long time to come! @Northern Snippet – yes it was spot on. Thank you! @Craig – I'm sure you'd enjoy it, and yes, Claire is excellent. So too is Eric, who has an impeccable record in the industry. And Richard, our head waiter, has also worked in some great places, though I'm afraid my memory is failing me to recall which. A great team they've pulled together around a great chef! Ah, good to see M. Koffman back properly. 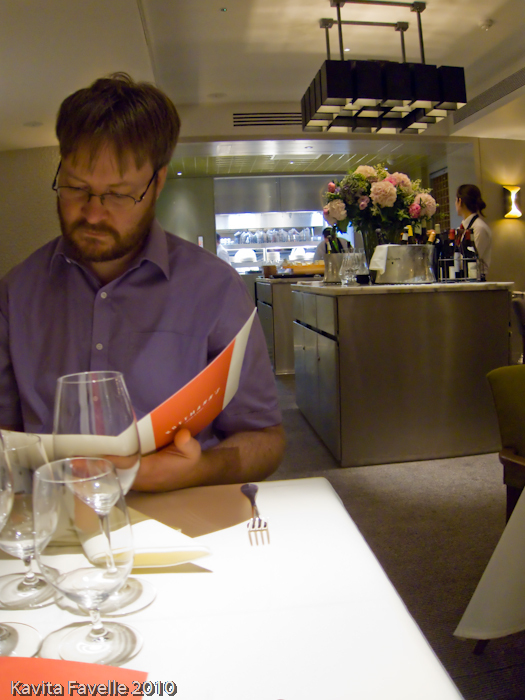 We celebrated our engagement with lunch at La Tante Claire. It's 14-and-a-half years ago but I can remember every detail. We also looked at going to LTC for our wedding breakfast and popped by the restaurant one Saturday afternoon. They were shut and clearly in the middle of dinner prep, but a very nice man brought us in, made us coffee, grabbed the diary, chatted about menus and prices and the like. It was only when he disappeared to check something and I flicked through the LTC cookbook on the table we realised it was Koffman himself. I missed the pop-up, but will definitely go to this one. I had dinner there yesterday but as usual will reserve my final judgement after 3 meals and several other courses have been sampled. Loved PK's food at the original Tante Claire in Royal Hospital Road. Clive Dixon of the Hinds Head will be joining in early August so it will be interesting to see how things develop . That definitely sounds like one to add to the list! That menu sounds lovely and must visit soon. 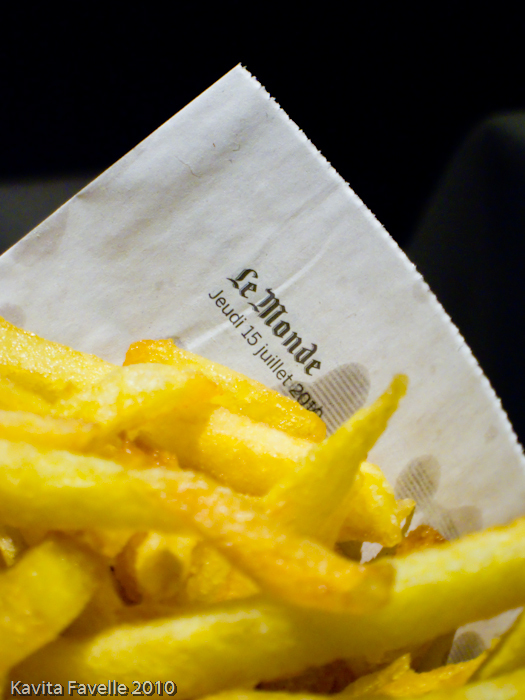 Have not had a proper French mean in ages and I can't resists good pommes frites. @Gastro1 – Fair enough. Since I'm a food blogger, and not suggesting for a moment that my single experience is the template for every experience, I'm happy to review on a single meal. After all, it's how normal punters judge places, and it's simply a report of an individual visit! 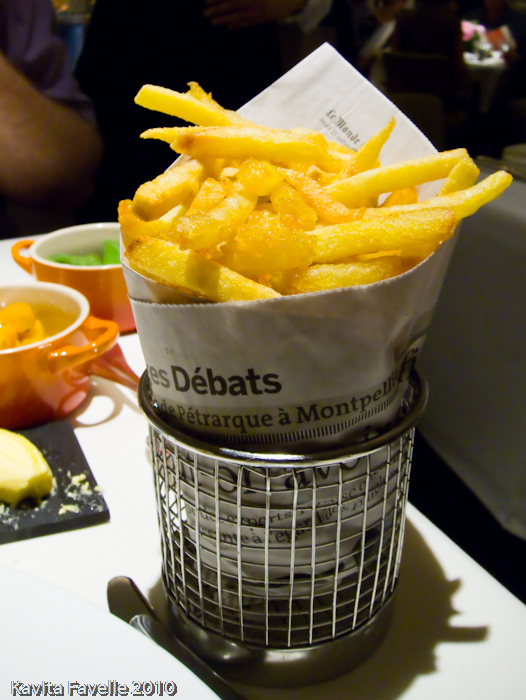 @Foodycat – I'll definitely be going back! 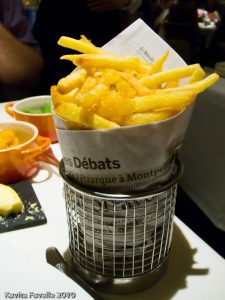 @May – those pommes frites really were rather good! 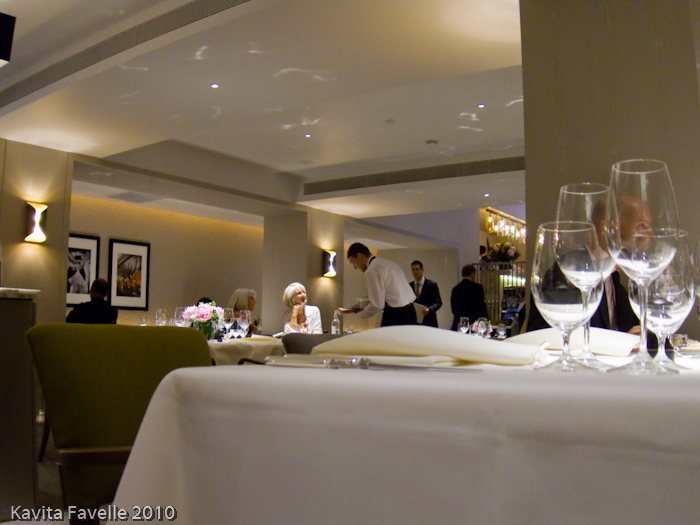 The prix fixe looks fantastic – will definitely return to try it. 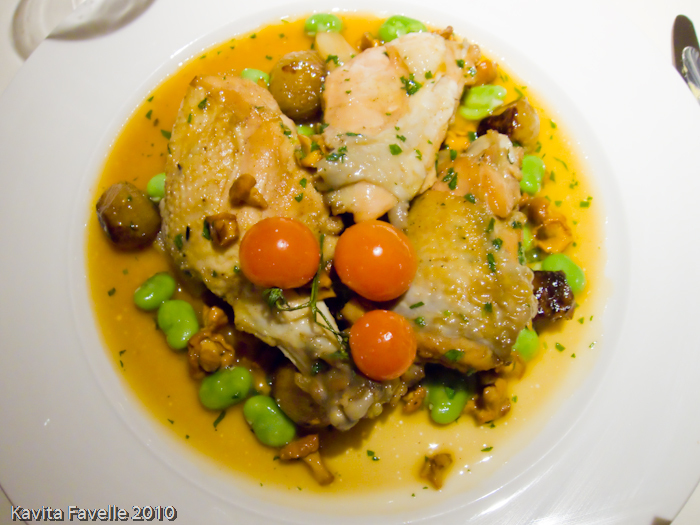 I especially like the look of the chicken fricassée. @gourmet traveller – I seldom order chicken in restaurants but I really, really enjoyed that dish. Yet another mouth-watering blog Kavey. 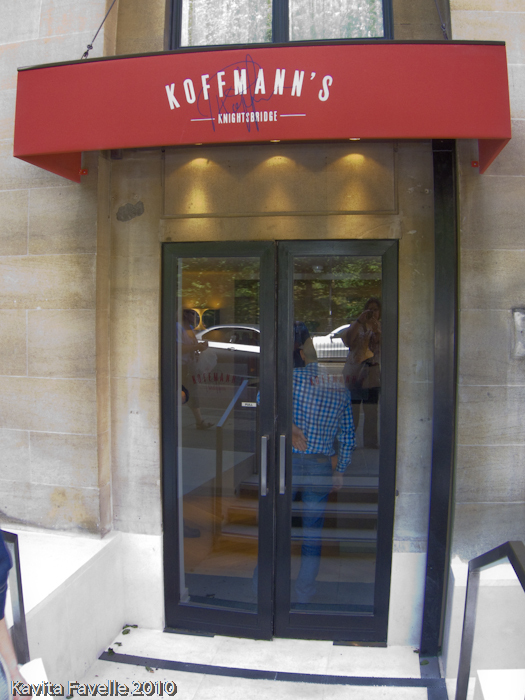 I can't wait to go to Koffmann's, and this has only cemented my desire! Those teeny macarons look like Pacman. I want. A happiness of mushrooms = perfect. What a stroke of luck to get in there last minute like that! Sounds like marvellous value even for lunch. I love the look of that black pudding served in standing up little semi circles – I'm easily pleased!!! @Kanga Rue – thanks, I hope you are able to visit soon. @Meemalee – Pac man rules. They were tasty too. Go, have all of it. You know you want to! @Bron – heh, thanks. I love love love 'shrooms! @Sarah – yes, if I understood correctly, they had been fully booked for Friday lunch, but took the decision on Wednesday to defer their PRs from taking any of the tables until a later date, so a number of tables were released on the Wednesday night, and I phoned rather serendipitously on Thursday morning! he is such a genius and his Daube de Boeuf is my favourite..
”Fungus the Bogeyman” – that made me smile, haven’t read it for years. I see what you mean, but maybe I'm odd as I think snails and green foam has quite a nice visual appeal. 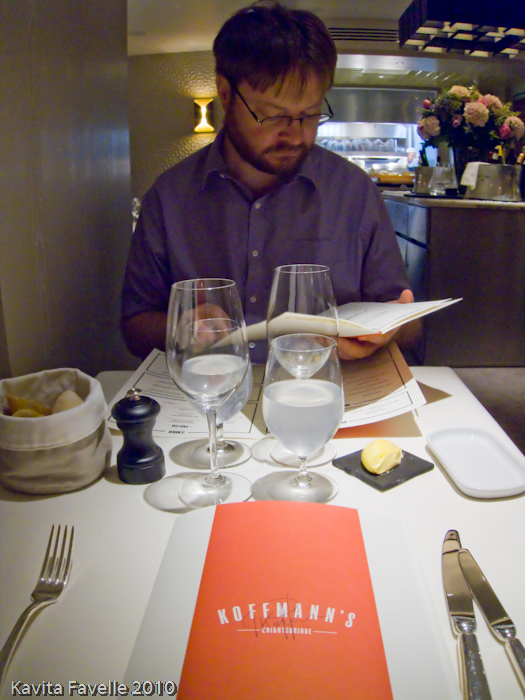 Lovely review though Kavey, this looks like a wonderful place and its great to see Koffmann back in the capital. @Mathilde – I can see why! @Shayma – yes very tasty indeed. When did your friend go? @NN – heh, I really really loved Fungus the Bogeyman! I don't mind the green – after all am used to the parsley garlic butter that is so commonly served with snails… I think it was green AND foam combination that was a bit… bogus! Thanks for your kind comments! Great to hear that you had such a good meal. 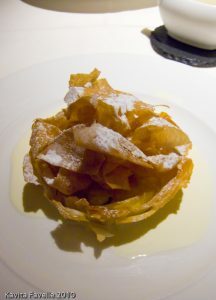 I'm looking forward to going soon – like you, I have wonderful memories of a fab meal at the Selfridge's pop-up. @aforkful – hope you love it too! Excellent review – I want some!!!!!! Koffman's pigs trotter signature dish has always intrigued me, and the Oeufs à la neige I've struggled to cook several times myself (unsuccessfully), Koffman's making it with caramel too is just rubbing my nose in it! @Sakkarin – that caramel topping was something else! Superbly executed and so delicious!